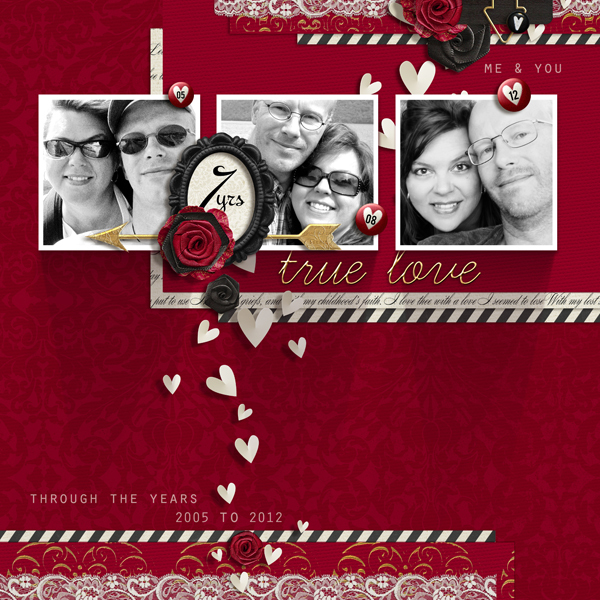 "Hugs & Kisses" digital scrapbooking layout by Brandy Murry. 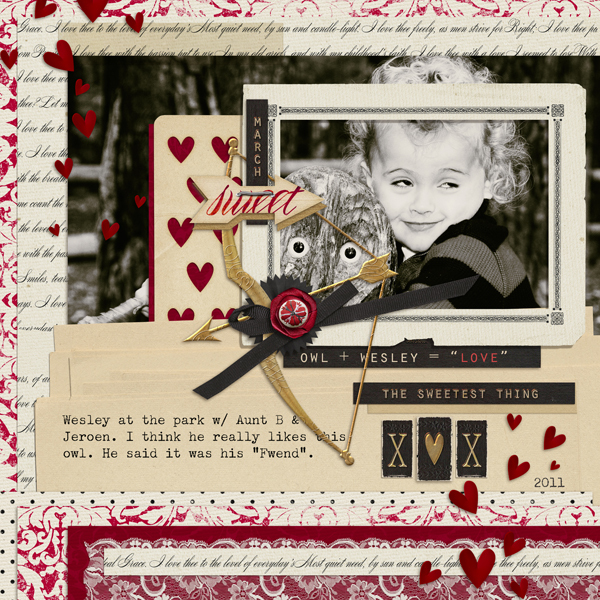 This digital scrapbooking love collection is all about remembering the ones we love. While it does contain several "Valentine's Day" related elements, it is mostly about expressing your affection and therefore is versatile enough to use for everyday scrapping. 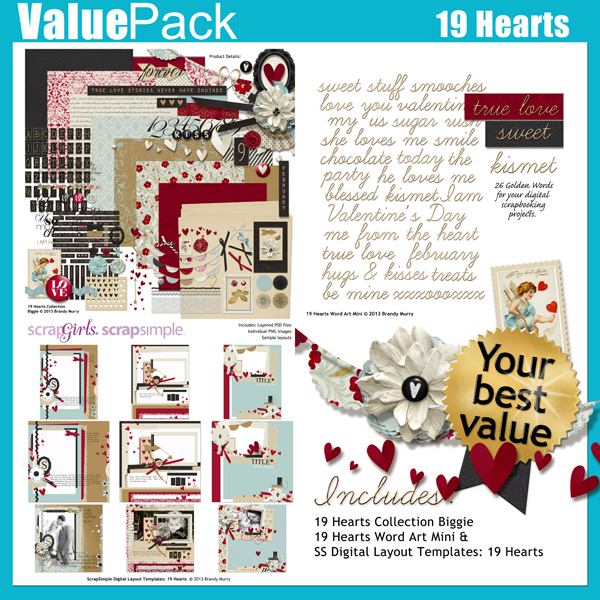 This digital scrapbooking alpha and word art is part of the 19 Hearts Collection Biggie and is only available with the set. There are 2 pages of word art that include Titles, Buttons, a promissory note, many singular word tags, beaded words, stapled word arrows and a very versatile black with gold stamped tab alpha set. 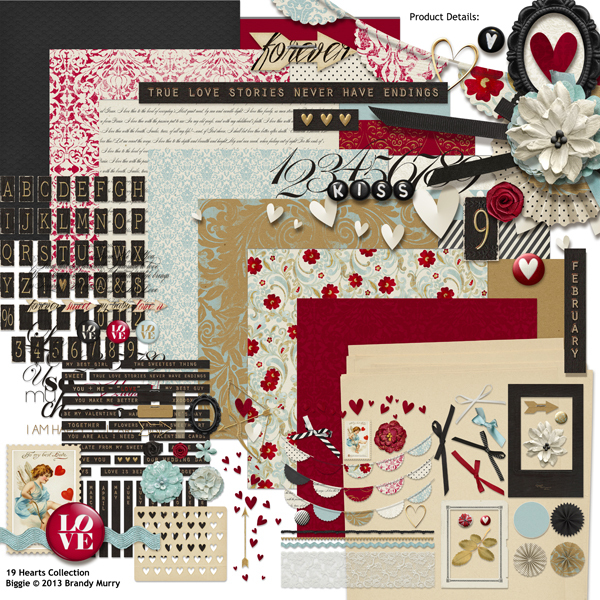 The 19 Hearts Embellishment Biggie is 3 pages (48 pcs) of digital scrapbooking embellishments in beautiful coordinating colors. 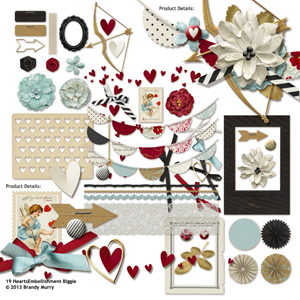 Included are items such as flowers, leaves, swags, lace, scattered hearts, Cupid's Bow & Arrow , a heart punched card, lots of bows, banners and scattered folded hearts. 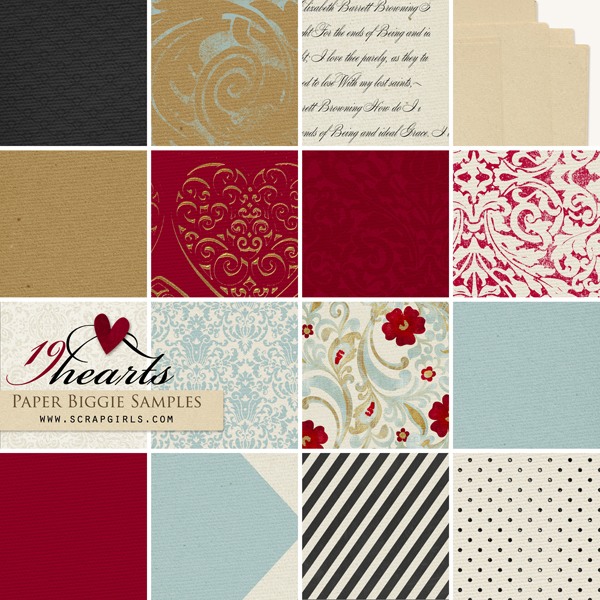 Set in a beautiful classic color combination of Black, Cream Soft Blue, Tans & Red, this paper set includes 16 digital scrapbooking backgrounds. The subtle patterns, accent patterns & coordinating cardstock is just the right combination to make gorgeous layouts for your scrapbooks. 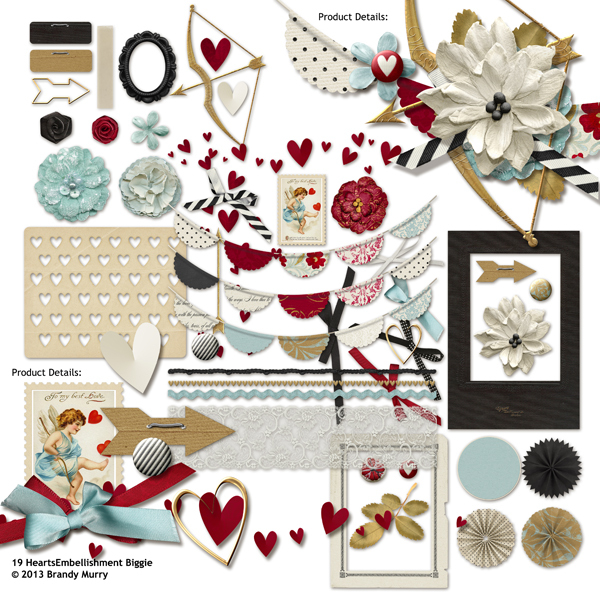 These beautiful digital scrapbooking paper templates feature intricate designs and curls! Hitting the road? Lots of us enjoy a good old fashioned road-trip, even the multiple "are we there yet(s)" from the kids. This digital scrapbooking & photobook collection will help you solidify those fun road-trip memories into precious keepsakes. Create beautiful, professional-looking layouts with ease using ScrapSimple Digital Layout Templates: Large Masks. Trendy instant file style frame templates. These templates are stacked in variations with anywhere from 2 photo slots to 5. 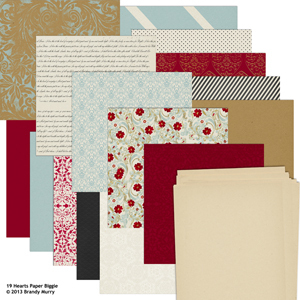 Fill with papers or photos and add them to your next digital scrapbooking layout. The Claus & Co. Button Alpha is an add-on for the Claus & Co Collection Biggie. It has all letters, numbers, some punctuation & Christmas icons. Beginnings. New beginnings can form at any time, at the start of a new year, a new goal, or a new milestone. Whatever your new beginning may be, this art journaling inspired digital scrapbooking kit is a great place to start your memory keeping. LOVE these. I love blended backgrounds and these are the secret to fabulous blending! These are a staple for me.